ISLAMABAD/LAHORE/KARACHI – After news spread that a renowned two time ousted husband is in line to be given a third tenure to head a family, nation’s serving husbands joined hands to rally across the major cities, protesting against the ‘injustice’. 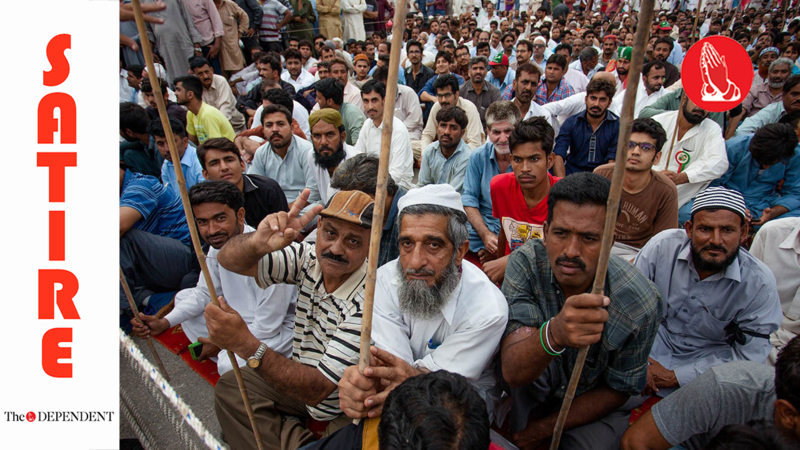 “This is unfair to us dedicated husbands who have successfully served and performed their duties without ever being ousted,” claimed a middle-aged protestor outside the Lahore Press Club. “This is setting the wrong precedent, and could led to further aggravate the tumultuous husband-wife relations across the country,” said another 60-year-old protestor. As the protests gather momentum across the country, the Parliament is set to take needed action, before things get out of control. According to reliable reports, a bill will be presented in the Senate to ensure that the move can be forestalled. “Marriage Reform Bill, 2018 will be introduced on Monday,” a Senator told The Dependent on strict condition of anonymity. “This would ensure that no ineligible person is allowed to head a family,” the Senator added. According to the bill’s draft, available exclusively with The Dependent, any ousted husband would need to sign an affidavit saying that they do not plan to run for the Prime Minister’s position, barring which they would not be given the state’s approval to marry again.